The truant ideal place to rest! Enjoy the fully secure private swimming pool for a swim and then take a sun bath! The terrace protected from the sun by a canopy and an umbrella is ideal for lunch outside, admiring the views over the Luberon. You can rent bikes, hybrid bikes, mountain bikes, tandems in the day to see the new bike path Calavon. The room blue bathroom upstairs is spacious enough to hold a full bath and a comfortable shower. We have just spent a most enjoyable week at La Buissonniere in Goult. Serge and Nadine’s property is delightful and provides every convenience to make your stay stress free. They are charming and unobtrusive owners who live nearby, Serge arrives early in the morning to ensure the good-sized pool is in perfect condition. However, the real reason you should stay here becomes apparent when you open the bedroom windows in the morning - the views over the Luberon are absolutely stunning. Naturally, we hope to return. Nous sommes très heureux que Graham et ses amis aient apprécié notre maison et c'est vrai que le plus de la Buissonnière c'est le matin quand on ouvre les volets et qu'on découvre cette vue grandiose sur le Lubéron:ça vous met en forme pour toute la journée! Nous serions ravis d 'accueillir à nouveau Graham et ses amis. My husband, daughter and I stayed here for a week in June/July 2018. We chose this house in Provence from all the listings as it looked the closest to our tastes. We were not disappointed. Nadine was a perfect hostess, funny, friendly and enthusiastic to try out English. Her husband, Serge, does not speak English but was able to communicate very well despite. The house is set back from the road and very private. You can hear the local traffic going by and there are a few neighbouring properties but we only saw or heard the neighbours a few times.The upstairs has three bedrooms and a bathroom and from one room you can see the village of Goult, another two rooms, views across the Luberon and the bathroom overlooks the pool in the garden. All rooms are painted in beautiful colours, and full of French charm. The whole house is SO charming and suited us very well indeed as we cooked, swam, relaxed in the deck chairs, ate at the table on the verandah or lazed inside watching the World Cup games. It was very hot the days we were here but the house remained cool with the shutters closed while we were out and then flung open at night before sleeping to enjoy seeing the stars outside. It was very pleasant in the mornings letting in the cool breeze before the heat of the day. We travelled all over Provence in our rental car from here during the week we stayed - L'isle-sur-la-Sorgue, Arles, Lacoste, Bonnieux, Apt, Loumarin, Menerbes, Gordes and Goult. We could have stayed longer as there is so much to see and discover. Each village has a different style of market, the huge markets of L'isle-sur-la-Sorgue to the smaller intimate market in Goult; and each village has it's own unique personality and beauty. So much to admire and be inspired and refreshed by. We will never forget our time here in this beautiful home in this extraordinary part of the world. Thank you so much Serge and Nadine! Your appreciation affects us a lot and we are always very happy when our house can bring happiness and when our tenants share our love for our Provence. We also appreciated much to discuss with Australians: it was the first time that we welcomed and if all Australians are so, we ask for more! We are a Canadian family with three young kids ages 3-8, we stayed here for 2 weeks in early June. I was looking for a vacation property in Provence where we could be near a village but still on a property with enough space for my kids to play outdoors, close to other towns to visit in the mornings and a pool for us to relax by in the afternoons, in a house with plenty of space for all of us and near a pretty village that wasn't overrun with tourists. This place was PERFECT! It exceeded my expectations. Goult is a beautiful little village that isn't overly touristy and had everything we needed, a weekly market (aside from the lavender and food, our favourites were buying dresses for the girls and pony rides around town), a great bakery, fruit and cheese shop and many great wineries (domaine de l'Angele was our favourite). Goult is also within a 20min drive from many other more popular villages and was only a 15 minute walk from the house. The house itself was really comfortable with a well stocked kitchen and comfortable beds. The house overlooks the Luberon and the villages of Goult and Lacoste, it's really beautiful. My impression from the photos before we arrived was that the furnishings, especially chairs were a bit sparse but it was truly perfectly comfortable. We also used the outdoor BBQ frequently. The pool was very important to me, I was worried it might be too cool in June. Nadine assured me it would be fine and it was amazing, we were here in a heat wave and the unheated pool was 30 degrees the whole time. The heat - I was so thankful that I chose a place with a nice private pool, Provence was much hotter than I ever imagined. It reached 30 degrees by 9am and got progressively hotter until 7pm when it reached 37 degrees. Despite the temperature, the house wasn't ever too hot to sleep. Nadine and Serge were very helpful whenever we needed suggestions. The house has no internet but we found free wifi at the library in a Goult. We had an amazing trip, I highly recommend this vacation home for a summer visit to Provence. Nous avons apprécié cette famille canadienne qui s’intéressait à notre région, était curieuse de tout découvrir et nous a laissé une maison impeccable, malgré les 3 jeunes enfants. Nous aurons plaisir à les accueillir à nouveau . We stayed here in early June of 2016. We had a wonderful time. While the Mistral blew from unexpected directions, it wasn't a bother. Pictures do not do this property justice. Location is perfect for exploring the outlying hill towns. Kitchen was well stocked with all the right utensils. The outdoor grill was a nice addition and utilized. The house is extremely comfortable. Great views of the Luberon valley and towns from property. We wish the washing machine came with instructions, as we couldn't figure out how to work it. Other than that we have no complaints about our week long stay at Buisonniere. Serge and Nadine's daughter speaks English and they are great hosts. We would stay here again in a heartbeat! Nous sommes très heureux que notre maison et notre région vous aient plus : c'est un grand bonheur quand on peut faire partager notre amour de notre région. Nous allons mettre une explication en anglais pour l'utilisation de notre machine à laver la vaisselle et la machine à laver le linge. Merci pour votre appréciation qui nous va droit au cœur. Das Haus ist angenehm eingerichtet, besonders die Küche ist gut ausgestattet. Das Haus liegt ein Stück außerhalb des Ortes, der aber zu Fuß gut zu erreichen ist. Goult ist ein wunderschöner Provence-Ort, aber nicht so schrecklich überlaufen wie die Touri-Orte Roussilon oder Gordes. In Goult findet man alles, was man braucht, nette Restaurants und Läden und sehr schöne Wanderstrecken rund um den Ort. Das Haus und vor allem der Garten ist noch viel schöner als man auf den eingestellten Bildern ahnen würde. Der Ausblick von der Terasse über das Luberon ist fantastisch! Der Pool ist sehr schön und groß. Auf den Bildern erscheint das Sicherheitsgitter etwas unschön und der Pool recht weit abgelegen, beides täuscht aber. Wir haben uns hier sehr wohl gefühlt und empfehlen es dringend weiter. Die Besitzer sind sehr freundlich und hilfsbereit! Wir kommen auf alle Fälle irgendwann einmal wieder! 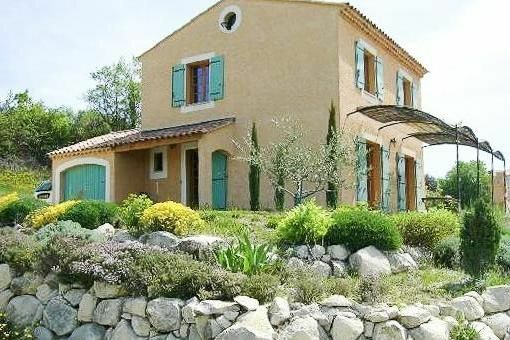 Excellent property in the heart of the Luberon!!! We spent two weeks in Provence and we were very happy with the Buisonniere. The views from the covered deck are spectacular. Goult is within a 15 minute drive of the more touristy towns of Rousillon, Gordes and Bonnieux, yet it has everything you need: a small grocery store, bakery and excellent cafe with free internet service. Nadine and Serge were wonderful hosts who made us feel right at home. We are saving their gift of homemade, wild boar pate (Serge is a butcher) for a special occasion. Visiting this very touristy area in October was perfect and I would highly recommend it. The bigger sites still had their share of tourists but for the most part, things were quiet. The house has all the amenities you need: dishes, cups, hangers, a fantastic stove and oven, a dishwasher, washing machine, cork screws, etc. The lounge chairs were very comfortable, as were the beds. The only thing missing (apart from internet service - but we really didn't miss it much), was a kettle - making tea required boiling a pot of water on the stove. The house itself was cool when the windows were open, and warm with them shut - important things to consider when traveling in October. We also saved a bundle by making most of our meals at the house. We hope to return to the Buissoniere next time we visit France. It was a wonderful place to stay and we felt right at home. At just over an hour (by car) from Marseille, it's in a perfect location. During our two weeks there we visited Aix-en-Provence, Arles, Orange, Avignon, the Camargue and Mont Ventoux - all of which were within a 90 minute drive. But the Luberon itself is the star attraction. The hill towns are rich with history, have excellent restaurants and shopping, and are filled with friendly people. Who knows, maybe we'll follow Peter Mayle's example and retire there. We will definitely be back. We look forward to seeing Nadine and Serge again and sharing the paradise they call home. The house is located close to the villages of the Luberon: 7 km from Gordes, Roussillon, Bonnieux, Joucas. 5 km, do not miss the castle of the Marquis de Sade, located Lacoste. Many hiking trails are near the house. The city center and shops are within walking distance, 1 km. La location est effective à partir du versement des arrhes qui s'élevent à 25 % du montant de la location . Le restant de la location sera versé 15 jours avant le jour de l arrivée à la Buissonniere. Nous serons là pour vous accueillir le jour de votre arrivée et vous remmettre les clefs. Si la location dure plus d'une semaine et si la piscine est ouverte, nous reviendrons au moins une fois par semaine pour nettoyer la piscine Si vous désirez les draps, il faut nous le signaler 15 jours avant votre arrivée et cela vous coûtera 20€ par lit. De même si vous désirez les serviettes de bain et de toilette, signalez le 15 jours avant votre arrivée et cela vous coûtera 10€ par personne.